There is something significant about having a big paper calendar marked up with important dates. Rather than a digital version, I mean. The printed version is so much more permanent, looking back at you whenever you walk into the room. The digital record is easily minimized or closed altogether. It needs constant courting, some action to keep it interested. Otherwise it is forgotten completely. Don’t get me wrong, keeping myself on track with digital tools is easy. I really like the way everything can be closed off and put away when I’m not working on it. I would rather walk away from it and not be constantly reminded. But we are all different. Evidently there is wiring in our brains which responds to hand written stimuli better than what is created on screen. 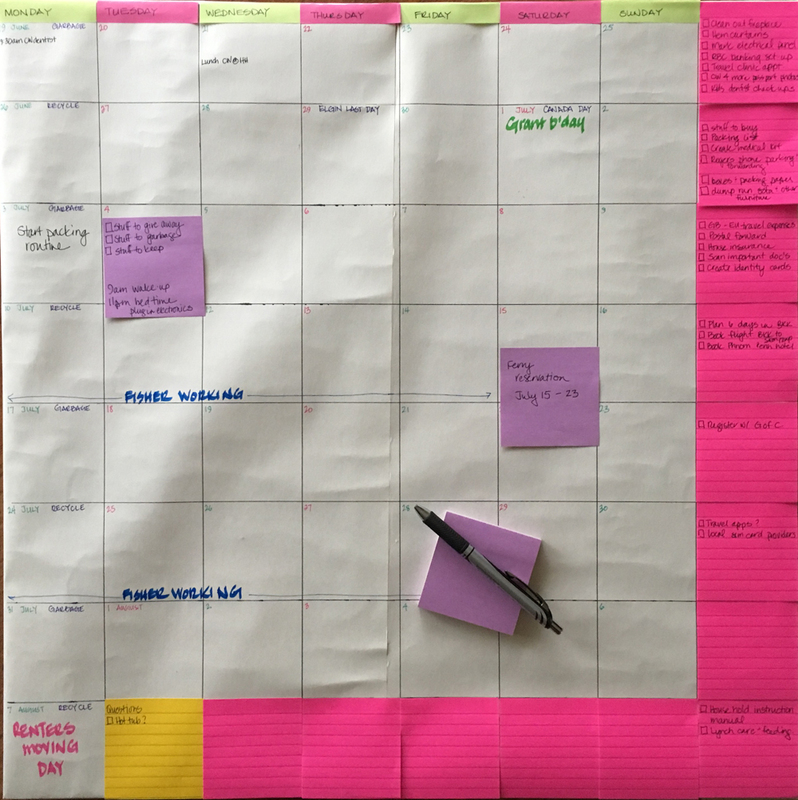 Therefore, when there is a big goal at hand, with multiple people involved and the deadline is many weeks away, a big old-fashioned paper calendar is the only logical solution. I happen to be pretty good at making these, so yesterday I created one. Paper from a roll is wrapped around a large piece of chip board. Days are marked in 3″ squares, which happens to be the size of a medium post it note. We have 7 weeks to go now. The importance of hitting the date, is more than ceremonial. Starting off our relationship with our tenants on a good note is something we will do. But, this deadline has been moved up by 3 weeks from what we originally planned for. Given that fact, I was understandably worried about our capacity as a family and a team, to pull together and get our respective jobs done. We kicked off the ‘pack-up’ project after a nice family dinner. I thought it would be really straight forward to explain. I’m still wondering why the conversation escalated to the point of shouting. My daughter was jumping to rash conclusions about how awful and unreasonable the entire summer schedule was. She was hearing, (I think), “you will have no time with your friends, this whole summer.” My son started to react to my daughter and at one point walked out of the room, mad at her for over reacting. I think my mouth was still open during mid sentence showing where the days of the week were located across the top of the calendar. My husband got everyone back on track. He made big promises about how easy it all would be and how quickly everything could be done, if we all pulled together. Then our kids calmed down. They started to understand what they needed to do first, in their own rooms, to downsize, organize and pack. They are quick to be rid of all their bedroom furniture so they may buy new pieces when we return. (That is not really in the budget, but is so far from now, I can’t think about it.) I suppose they are just being helpful! I think this is test number one for our little family. We have a job to do, with many small, moving parts. Everyone needs to play a role. We will be working together and alone, sometimes in small spaces. It is important work, with a shared purpose. We each value our contribution, for without each person, it cannot be done. Good practice for the year of travel ahead. ← What can we reasonably take care of? Somehow it all gets done one way or another! And truthfully, I kind of like planning! That DID escalate quickly. I think the reality of the whole trip is starting to sink in… for all of us! Yes it did! Something I have been living and breathing all the time for months! Was nice to share the load, even if it is still in theory!